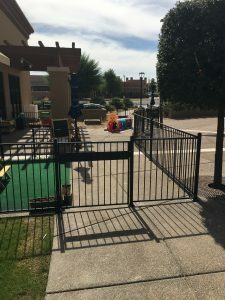 For preschools and child care centers considering installing new fencing and gates around their outdoor play spaces, wrought iron offers a safe, cost-effective, and stylish option. 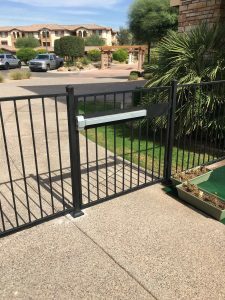 Wrought iron is highly durable, so it is resistant to dents and breakage—making it an effective barrier to keep children safely inside designated areas. This durability also enables wrought iron to withstand the wear and tear that comes with being exposed to harsh sun, rain, and of course, kids playing nearby. As a result, wrought iron fencing will ensure safety while maintaining its naturally neat and sleek appearance for years to come. At DCS Industries, we specialize in designing, manufacturing, and installing wrought iron fences and gates that suit the needs and styles of various types of properties. Our team is knowledgeable about state and local laws regarding fencing, including those that apply to preschools and child care facilities. For example, we know that some cities require preschool gates to be equipped with panic bars, which allow large groups of people to easily exit an area in the event of an emergency, and will install these bars if necessary. Need a new fence or gate for your preschool or child care center? With over a decade of experience, our team will work with your business to create fencing and gate solutions that complement the appearance of your property while complying with applicable laws, reducing liability, and most importantly, maximizing safety for your students. Contact us today at 623-825-7700 for a free estimate!